Normally, singles compilations are a half-assed attempt to keep fans interested in a band while they slave over a new album. Well, that, or it's a sign of their days being numbered or over. 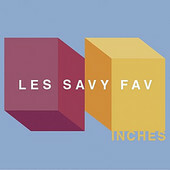 Les Savy Fav though, abolishes that system with Inches, their first album since 2001's Phil Ek-produced Go Forth. In fact, Inches is their finest record to date, which may seem a little odd, yet there's a good reason why. LSF have handcrafted this release for fans over the past eight years. In 1996, the plan was to release nine 7" singles over a number of years on nine different labels. Fans who have collected the singles will find this compilation to be welcome closure because as a batch of 18 songs, it flows majestically. Throughout their existence, the band has obviously evolved and improved, and while the running order is chronologically backwards, it's tough to pinpoint any real flaws in their evolution. "Meet Me In The Dollar Bin", their newest track to date, isn't much of a stretch from what they were doing three years ago, but what it does show is just how little cred they received for helping kickstart the whole dance-punk scene. The best moments, "Yawn Yawn Yawn" and "Our Coastal Hymn", show off the playfully ingenious guitar work of Seth Jabour. His touch seems effortless, yet is so significant in making this band a powerful ball of energy. Inches is filled with off-putting rhythms, spastic vocal gymnastics and diverse musical patterns. Behold, Les Savy Fav can finally be realized.